Doorless showers are quickly becoming a popular addition to bathrooms in homes across the nation. The designs of doorless showers look sophisticated and modern and add a touch of class to this often overlooked area of the home. There are many different types of doorless showers that can be included in the bathroom area of the home, giving homeowner dozens of options to choose from to find the right shower design for them. The ultimate design of the doorless shower will greatly depend on the available space in the room it is being placed in. 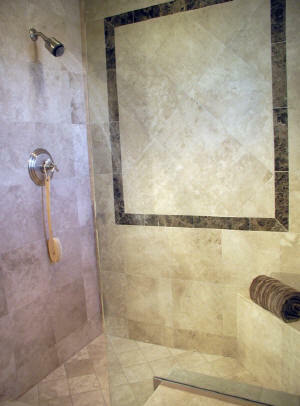 Some of the shower designs are small and compact, intended for use in a small area of the home. Other shower designs are as large as entire rooms and can only be placed in homes that have a large enough area that can be designated for the shower. One of the most common types of doorless showers placed in the home is the doorless shower with curved walls. The curved wall of the shower aims the shower head at a portion of the wall allowing the water to bounce off of the wall onto the floor and down through the drain, typically located in the middle of the floor in the shower. The curved wall of the shower adds privacy to the semi-enclosed area and allows the design to be placed in smaller areas of the home than other types of shower designs. Another common type of doorless shower design includes a walkway leading to a separate room for the shower. These designs typically take up a larger area of the home but many individuals like them because they provide a spacious area for the shower set apart from the rest of the bathroom. The walkway provides many benefits including ensuring that the water cannot flow out of the shower, increasing privacy, and providing a barrier for any cool air entering the bathroom so that the warmth of the shower can be enjoyed without any interrupting breezes. Doorless showers can be created out of a number of different materials and created in virtually any color or shade that the homeowner desires. Ceramic tiles are a popular material to create the showers from because of their ability to withstand the heat and moisture of the shower for long periods of time and the ease in which the tiles can be cleaned and sanitized. Other materials commonly used to create a doorless shower include blocks of glass, thick glass walls, stone slabs or blocks, and certain types of strong plastics.